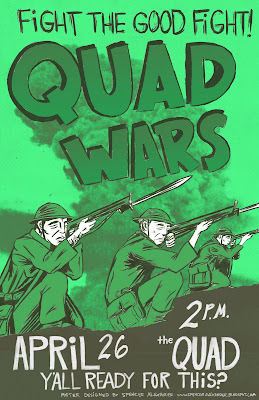 Poster I made with some help from my man Alex Derwick, for the SUNY Purchase Quad Wars. I've recently joined the ranks of the band Wyldlife. 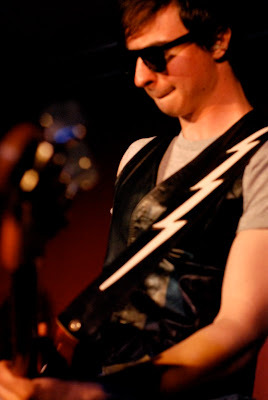 We're playing at the Suny Purchase C0-0p this Friday, April 24th at 8:00. Its going to be a sick show, and its free! Come check it out! I've been working on a collaboration with my girlfriend Jenni Berthelot, who is a student in the dance conservatory at Purchase College. We wanted to do a collaboration combining visual art, music, and dance, which would lead to an investigation into my subconscious. We chose the song "Saeglupor" by the band Sigur Ros, and translated it into three tones of green. First I painted while the song was playing with light green paint. Then I took the painting off the wall and Jenni danced on top of it to the music, with green paint on her socks, making some really beautiful marks on the paper. Once Jenni had finished I hung the painting up on the wall and stared at it for a while trying to distinguish some figures or characters in the lines that Jenni and I had created abstractly. After staring at it for about half an hour I was able to make out a bird's head in some of the brush/feet marks, so I brought it out with dark green paint. I'm really happy with the end result, and we're talking about making more paintings to different songs, so stay posted! I've been working as art director for this record label shack attack records, and their first production was my buddy Nick Corbo. I had the opportunity to hand print every cd. 2 color screen prints in an edition of 97, just $5! Thought I'd post some of my favorite photos. enjoy!